Two wing cutters in 1/2" shank size to produce traditional raised and fielded panels. 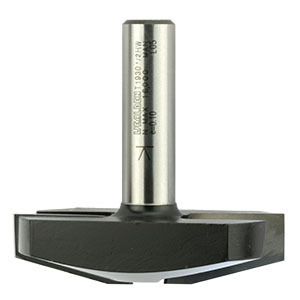 These cutters produce a maximum raise width of 42mm when used without a guide bearing. They can be used in stationary machines and may also be used in the larger variable speed portable machines. A bearing guide kit is available to fit these cutters and when used with the bearing, the tongue dimension "E" becomes 6mm. This kit can be added to the order by ticking the box or may be ordered separately from the Bearings & Spares menu. N.B. 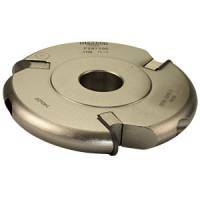 THESE ARE LARGE DIAMETER CUTTERS - PLEASE ENSURE THEY WILL FIT THROUGH THE BASE OF YOUR MACHINE AND THROUGH THE ROUTER TABLE. MAXIMUM SPEED FOR THESE CUTTERS IS 12,000 rpm.